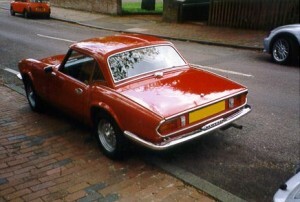 My Spitfire just after its bodywork restoration. The fuel filler cap is positioned in the centre of the car just behind the rear screen of the hard top. I’ve received a number of emails from other Spitfire owners (and from those contemplating buying one) asking about fuel consumption so I though I’d present the figures for my own car whilst I had it. I always recorded the mileage between fill ups, partly because I too was interested in the consumption figures but also because the fuel gauge seemed so vague and indecisive, and I didn’t want the car to run dry – preferring to keep at least a quarter of a tank in it at all times. My mechanism for recording the consumption involved nothing more than always filling up to the top of the tank, and resetting the trip counter whenever this happens. (By the top of the tank I meant with the fuel just into the bottom of the filler pipe after nudging the car to get rid of any air bubbles). So each time I ended up with the mileage since I last filled up and the amount of fuel used during that distance. The figures were stored in a Microsoft Excel spreadsheet to calculate the consumption figure, and since it’s not a particularly scientific method I also kept a rolling average of the last 5 fill ups. As well as the table of the results I thought a graph would be easy to take in and so I got Microsoft Excel to make them for me. Use the links below to open up either the images of the graphs or the tables of results. Along with the data I have included a list of significant occurences – services mainly, and other relevant comments. For the first 5 months (approx) that I owned the car it was running on leaded fuel. The second set of values cover the period after the restoration up until November 2001. During the restoration a TSSC unleaded head was fitted to the car.